We receive a lot of calls and queries on a daily basis here at Great Grass, and while they’re always varied and different depending on who’s getting in contact, the majority of people are always interested in whether or not our grass is suitable for kids, dogs and other pets that may very well end up frequently. We’re very happy to report, as ever, that our artificial grass is indeed the perfect fit for children, especially if you opt in for one of our ultra-soft, luxurious products such as our 36mm Touch of Luxury lawn. With velvety soft design, you’re sure to discover that this product is the best way to put down a fully authentic artificial grass surface that will allow your kids to enjoy every minute they spend playing on it. Our 36mm Touch of Luxury artificial grass is absolutely compatible with pets, too, and that’s understating it. Whether you’re a cat person or you keep dogs in the home, you won’t ever have to worry about your pets with an artificial grass lawn as they’re guaranteed to fall in love with how soft the grass feels from the moment they first put their feet down on it. Especially with the long pile height of the grass and the soft, innovatively designed infill, this artificial grass makes for an especially suitable match with dogs that love going out for a run on the meadows. Add to that the fact that every one of our artificial grass products does away with the hassle of mud and all of the maintenance involved with keeping a lawn in check, and it should be clear why so many people pick Great Grass to provide everything they need. You can expect all of that and more with our 36mm Touch of Luxury artificial grass, so don’t wait to get in touch! Our artificial lawns are incredibly reliable, beautiful, and just waiting to find a place in your home, so why wait to make that first step toward investing? 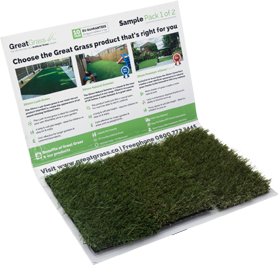 Whether you’ve got your eyes on our 36mm Touch of Luxury artificial grass lawn, or you’re looking to invest in any other product in our stock, make sure you let us know! All it takes is a phone call or email if you’re looking to get in contact.